Facebook might annoy me in many ways (especially with how they seem to treat bloggers), but despite that, there are some aspects of it I'm very thankful for. One of those is online groups. These groups are wonderful. I have a community of moms, a community of writers, a community of women, who are there to hear my venting, offer advice when I ask, and generally let me feel like I'm not alone. The other day I got involved in a discussion in my blogging group about time management. We tend to go back to this discussion a lot. 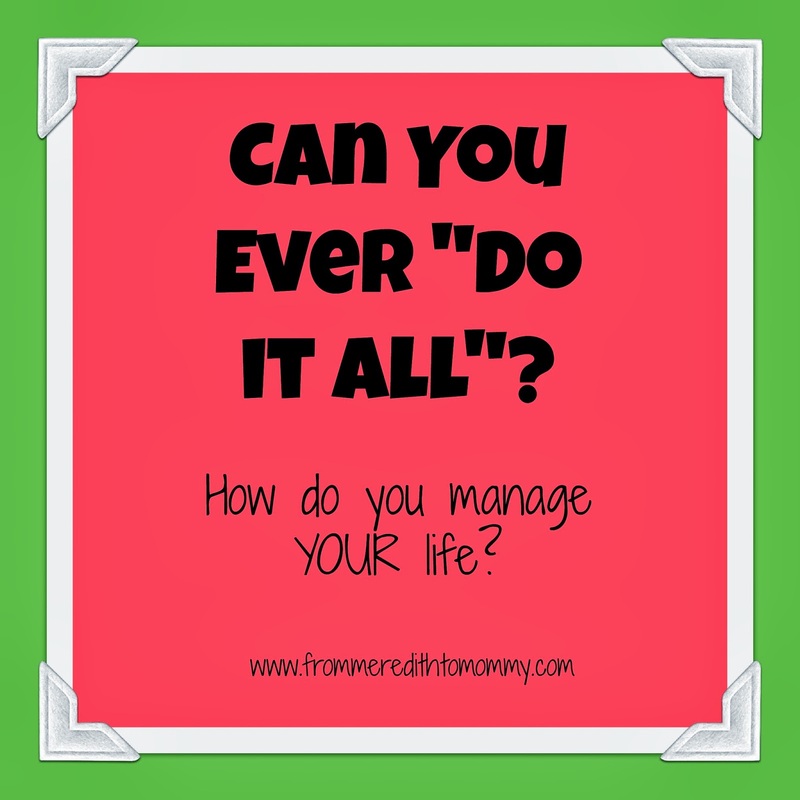 How do you find the time to do everything you need to do? To do all the writing you want? To do all the blog maintenance you need? To keep the house clean? To keep the family fed? To keep the kids cared for? I've been posting in spurts lately. I get into a good routine, a good rhythm, and then something throws me and I'm right back to where I started, trying to will myself to finish one of the many drafts I've started, trying to catch up with the house, trying to make sure the laundry is done, the meals are made, the kids are happy, life is managed. Because once you fall behind, catching up is hard. Once you start neglecting something, it's tough to get back. Once I'm out of my writing rhythm, once I've fallen behind in regular posting, it takes me more time. Time that I don't have...so I don't post. So I need more time...which I don't have...so I don't post again. But if I decide to write and neglect the house, things build up. The floor needs scrubbing instead of just a mopping. The toy soup needs to be sorted. The counters need to be decluttered instead of just cleaned. The jobs move from quick ones to big ones...which I don't have time for. So I push them off...so they get bigger...so I don't have time...so it doesn't get done. Then there's time for me. If I stay up late, cleaning, writing, organizing, I end up grumpy. Little things start to bug me. The girls get on my nerves. Adam gets on my nerves. I'm tired. I get resentful. My writing isn't great because I'm not focused and inspired. I feel like a short order cook, and a maid, and one who isn't appreciated, because I never have any time to myself. I'm not so much managing my time, as I'm managing my life. I have small children who have ever changing needs. One day I get a three hour nap from both of them, and I'm able to write and do blog maintenance with no interruption. The next day I'm up and down the stairs, cajoling them to just lie down and close their eyes. I don't dare get myself involved in anything, since I won't be able to focus. One day they'll play beautifully together, and I'll be able to clean and organize while they happily play. The next day they can't seem to do anything without my constant presence, and the house grows messier and messier. One day I'll put the girls to bed and take a relaxing bubble bath, reading a book, then catching up on my DVR, knowing that the house and the blog are both in order. The next night I can't let myself relax until all the laundry is put away, and by the time I'm done, I'm crashing into bed. I know that as the girls grow, I'll get better at this. They can help more. They can play and work independently. I might not have six free hours while they're at school, but that doesn't mean that I'm doomed to a lifetime of hovering. They might not be able to vacuum or clean a bathtub tomorrow, but eventually they'll have chores to take some of the burden off me. There's a time where dinner help will save me time, rather than add additional time. I also know what works for me right now. Big writing projects (of which I've just completed a few) are best left for the weekend, when I can escape to Starbucks for a few hours. Next summer, when I get my mother's helper back, I can steal a few mid-week hours to take some of the burden off the weekend. Blog posts happen whenever I can catch a few moments. Cleaning happens during Reagan's nap and Madison's rest. And after the girls are in bed, that's my time. Relaxing, connecting with my husband, reading, bubble baths, maybe even a glass of wine. Am I managing my time well? Maybe not. I'm often behind, and there might never be enough hours in the day. But am I managing my life? I think I just might be! How do you manage your time? I know everyone finds their own routine and balance, but what works for you? What DOESN'T work for you? I ALWAYS have time to keep on Facebook! Make sure you are following me there! I'm also making an effort on Instagram! Are you following me there yet? Gee, WHY don't I have time?